First of all I’m delighted to welcome Hikmat Subhi to the team as research student working on the College of Optometrists’ project on the functional assessment of visual fields in the low vision assessment. Hikmat has certainly hit the ground running this week and I’m looking forward to lots of progress on this exciting project. Meanwhile, Maria Katsou received lots of interest and positive feedback on her poster presentation at Optometry Tomorrow. Here she is with her poster, with the abstract below for interest. 1. Visual Function and Physiology Research Group, Department of Vision and Hearing Sciences, Anglia Ruskin University. 2.Vision and Eye Research Unit, Anglia Ruskin University. In May 2012 the visual requirements for driving in the UK changed. Candidates for the driving licence should be able to read a number plate viewed at 20m and achieve a visual acuity of 6/12 with the aid of any necessary refractive correction. The aim of this study was to investigate the relationship between the number plate test and visual acuity as measured with three different charts. The impact of the change in visual standards is discussed. 116 participants (age 24.9 ± 9.7 years) read three distance visual acuity charts – Snellen, logMAR Sloan, logMAR Landolt – without refractive correction at 6m. Charts were presented using Thomson Test Chart 2000 Xpert software. Snellen acuities were scored on a full line basis, with Sloan and Landolt acuities scored letter by letter. Participants then read 3 number plates outdoors without refractive correction. Bland-Altman plots were used to examine the equivalence between visual acuity charts. No difference between charts was significant as the 95% confidence intervals included no mean difference. However, mean acuities with the Landolt chart were slightly worse than with the Snellen (0.05±0.14logMAR) or Sloan charts (0.12±0.10logMAR), and Sloan acuities were slightly better than Snellen (0.07±0.11logMAR). The 6/12 (0.3logMAR) cut off provided sensitivity and specificity for passing the number plate test of 98% and 85% with the Snellen chart, 94% and 88% with the Sloan and 98% and 73% with the Landolt chart. Of those who were able to read a number plate at 20m, a further percentage were unable to meet the visual standards for driving by not meeting the 6/12 standard: this constituted 15% of the sample with Snellen, 12% with Sloan and 27% with Landolt. The new visual requirements for driving will result in optometrists examining some drivers in the test room who do not meet the acuity standard of 6/12, despite being able to read a number plate at 20m. Optometrists should note that the ability to achieve an acuity of 6/12 will depend, to some extent, on the chart used for acuity measurement. 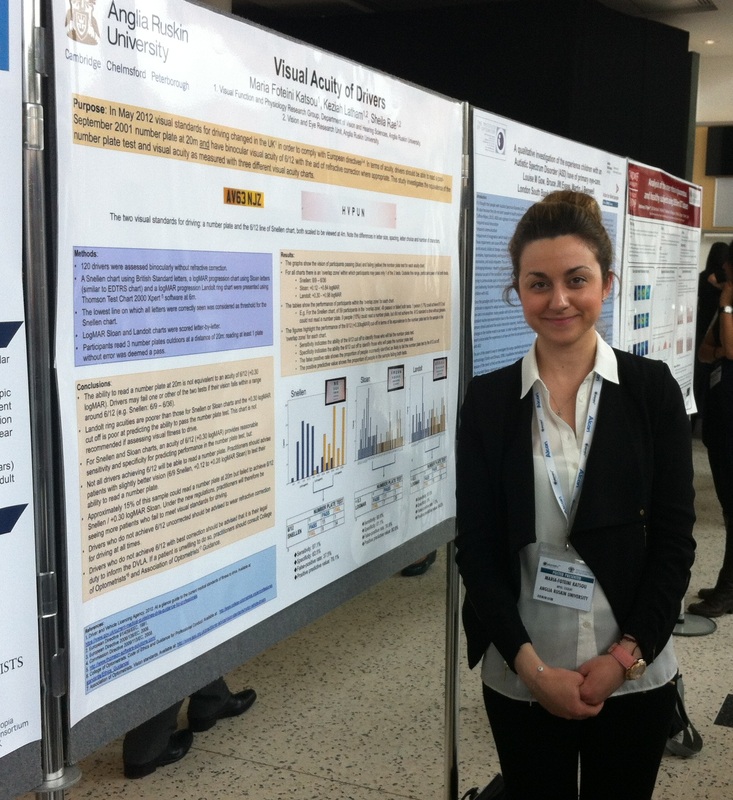 Maria Katsou is presenting some of her MPhil work as a poster at the Optometry Tomorrow conference in York this weekend. If you happen to be there, pop by and have a chat! Visual standards for driving changed in 2012, so that a driver must not only be able to read a number plate at 20m, but also have an acuity of 6/12. Maria has been looking at the relationship between these two tests, and at the effect of measuring acuity in different ways.